It's common knowledge that a number of big-name firms are dabbling with concepts involving foldable display tech. Most recently, the rumor mill has suggest that Samsung will release the Galaxy X next year with a flexible display boasting 4K resolution. As industry leader, it makes sense that Sammy would wish to be among the first to deliver folding display technology to the masses. But the Galaxy maker could face stiff competition from smaller firms like Oppo, whose bendy display endeavors have been evidenced in a new prototype leak. Folding smartphones were commonplace just over a decade ago, before the touchscreen waded in and changed the way we interact with our devices. We're led to believe that these new age foldables will be quite different from the clamshell-like handsets of old, given that their displays will bend and flex in ways that current devices do not. Cool. But is there any real benefit to a folding display? Aside from the above photo, there aren't many details to accompany the new Oppo leak. The device appears to be a phablet, with a hinge behind the display that could make the device easier to pocket than the current crop. Seeing a device fold up like a Nintendo DS is all well and good. But it remains to be seen whether the trend will catch on, or if it'll even hit the mobile consumer market. There's the space-saving factor, of course, allied to the fact that the display would potentially be less susceptible to scratches. Presumably, viewing content in landscape mode would also have a certain appeal; bedside Netflix might be a whole lot more desirable than currently possible on a flatter smartphone or tablet panel. Let's be honest, though—this particular concept doesn't scream usefulness. But with plenty of wider interest from the likes of Samsung and also LG, devices with folding screens may soon rise to prominence. Let us know what you make of Oppo's concept and folding smartphones generally by dropping a comment below. Smartphone turning to a tablet or TV screen? Yeah, dreams are nice and all, but remember to wake up! Smartphone to tablet is possible. I guess he just said TV that wraps around. Asus PadFone already did it with a different approach... 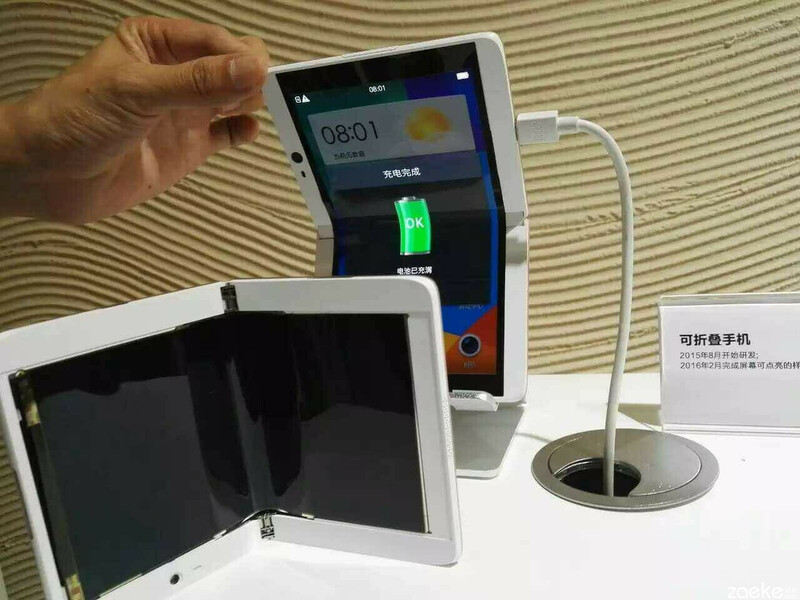 This folding tech might be close enough to maturity to make a Phone-to-Tablet real... Maybe a 5" screen that can fold open to create something close to 8" across. I can see flip phone comming back as full fledge smartphone with big screen when unfolded :) Would love one personally. Now the Question is the repairability. I don't expect transformable device like phone to tablet kind of things. But I really looking forward to buy smart bracelet that have screen going round my hand. Already been done in Japan, you guys need to read up. “Perfect One” People say perfections are not found anywhere. But I say perfections are found out. There are perfections in the cell phones. But you should be smart enough to find out which one is perfect. The perfect competition was found out between Oppo F1 plus and vivo v3 max. Both of them can’t beat the competition but Oppo F1 plus can because of its features. The internal space of 64 gb gives superb dimension to the phone. Mast phone. “Great Concern” The Oppo F1 plus and vivo v3 max both of them are on the great race. Both of them really is working hard to satisfy the customers. But I would like to say that Oppo F1 plus has much more to say. Like the camera of 50 megapixel, front camera of 16 megapixel is always rocking. The camera makes the difference in the phone. It really beats the competition. Simply we can say that Oppo F1 plus is working for making difference in the society. “Terms Matched” There has to be something really awesome. When choosing the phone one has to have the best phone of this earth otherwise it is useless to waste half of the time over the same. The phone that really looks smart has to be in your hand. This is how the best phone has to be with you. The best phone is Oppo A37, the best high dimensional camera phone is here.